Our Skill-Score is the automatic qualification engine for every profile. Based on machine learning and algorithms we combine this score in each candidate. Separated into a seven star rating, it gives you a summarized overview of the quality of each potential software engineer or designer. The higher the score, the more qualified the candidate is. Our current scoring range goes up to over 100. 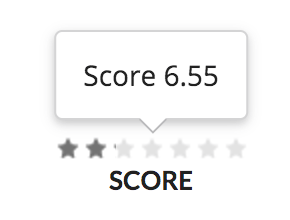 Every profile ranked with a score above 10 is a really good one.